It’s official. You’re pregnant and a baby is going to be in your arms—and in your house—in less than nine months. 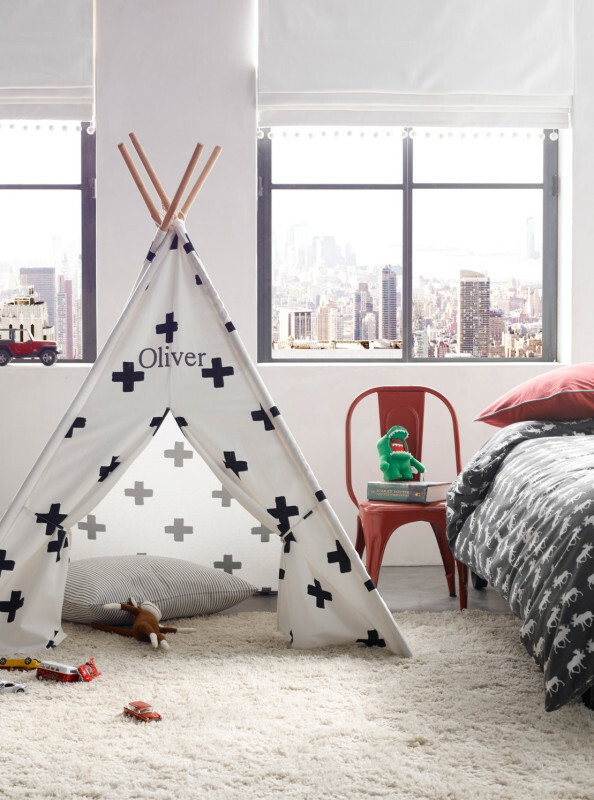 Herein starts the process of designing your little one’s nursery. 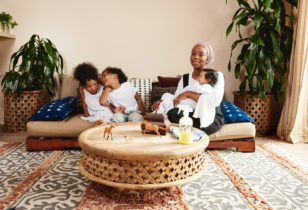 Of course, beginning the journey from scratch can be a daunting process, which is why we recruited interior designer (and mama) Katie Martinez to help us design three nurseries with our friends at Restoration Hardware Baby & Child, and deliver some must-read advice along the way. Click through to get inspired! 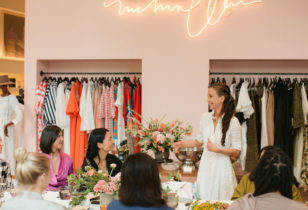 Bonus: Restoration Hardware Baby & Child wants to help you get started on your own child’s space by gifting you a whopping $2,000 towards its gorgeous merchandise. Find out how to enter to win here! 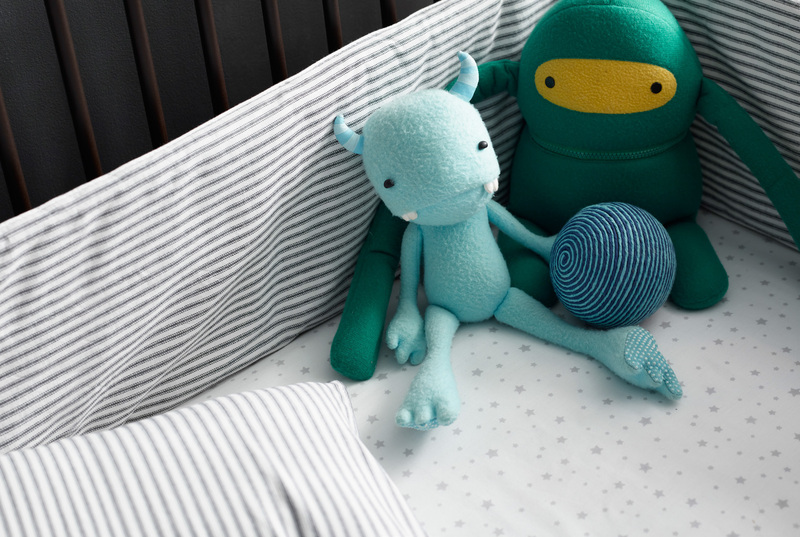 To save 10% on your first RH Baby & Child order, sign up for the company’s newsletter here. Not every baby gets a room to herself. If you've got one big room, try housing two (or more) kids in it and creating a playroom effect. If space is tight, note that a twin bed can take the place of a glider for all your feeding and story-reading needs. Millbrook Iron Crib, $849; Garment-Dyed Vintage Ticking Stripe Crib Bumper, $199; Star Print Crib Fitted Sheet, $44; Garment-Dyed Vintage Ticking Stripe Crib Skirt, $109; Garment-Dyed Vintage Ticking Stripe Boudoir Sham, $44; Mercantile Oversized Stacking Bins, $699; Printed Canvas Black & White Teepee Tent, $159; Atelier Scissor Task Floor Lamp, $359; Moda Shag Rug, $499-$1299; X-Ray Photography Art, $249 each; Pom-Pom Linen-Cotton Roman Shades, $159-$239; Le Mans Pedal Car, $299; Chalkboard Paint, $15; Industrial Cart Platform Bed, $549-$699; Moose Flannel Duvet Cover, $99-$119; Heathered Jersey Sham, $26-$39; Vintage Steel Play Chair, $75-$79, all RH Baby & Child. Whether it's baskets, felt bins, or something sturdier like this set-up, you'll want to find storage solutions for your child's toys and books. Keep things looking tidy (perhaps saved for days when you have visitors) by color coding the items for a cool rainbow effect. Mercantile Oversized Stacking Bins, $699; X-Ray Photography Art, $249 each, both RH Baby & Child. Sure, chalkboard paint isn't especially new, but it also hasn't lost its ability to make a room instantly playful. Bonus: You can draw baby-safe art above your child's crib, instead of hanging anything. And as your child grows, she'll love drawing all over the place. Chalkboard Paint, $15; Millbrook Iron Crib, $849; Garment-Dyed Vintage Ticking Stripe Crib Bumper, $199, all RH Baby & Child. Who says you have to buy all of your bedding from the same collection? We like the idea of mixing, matching, and playing with the scale of multiple prints, especially those in the same general color family. Garment-Dyed Vintage Ticking Stripe Crib Bumper, $199; Star Print Crib Fitted Sheet, $44; Garment-Dyed Vintage Ticking Stripe Boudoir Sham, $44; Millbrook Iron Crib, $849, all RH Baby & Child. We can't say enough good things about investing in blackout shades for your child's room. It means your kid will sleep better and longer—and so will you! 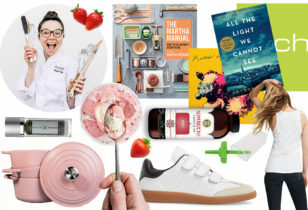 Pom-Pom Linen-Cotton Roman Shades, $159-$239; Printed Canvas Black & White Teepee Tent, $159; Moda Shag Rug, $499-$1299; Industrial Cart Platform Bed, $549-$699; Moose Flannel Duvet Cover, $99-$119; Heathered Jersey Sham, $26-$39; Vintage Steel Play Chair, $75-$79, all RH Baby & Child. One of the best ways to make a statement and create a mood in your baby's space is to choose your lighting carefully. Don't be afraid to pick something that's atypical for a nursery, like a bold and modern chandelier or a sophisticated brushed-metal lamp. Try to incorporate different levels of light coming from different sources—the ceiling, a wall sconce, a reading lamp, etc. And make sure to include at least one shaded lamp to keep the light diffused and mellow for nighttime. A dimmer switch is also a great idea. Anselme Large Chandelier, $729; Antiqued Metal Drum Floor Lamp, $589; Miya Rug, $1165-$11065; Airin Spindle Crib, $849; Garment-Dyed Diamond Quilted Crib Bumper, $219; Garment-Dyed Linen Crib Fitted Sheet, $69; Garment-Dyed Linen Skirt, $219; Garment-Dyed Diamond Toddler Quilt, $129; Mini Tufted Tub Chair, $299; Wooly Plush Elephant, $18; Amira Inlay Dresser, $1449; Amira Inlay Dresser Topper, $279; Washed Organic Linen Changing Pad Cover, $39; Large Jewel Mirror, $699; Luxe Knit Stuffed Bunny, $18, Hand-Folded Paper Butterfly Art, $299; Petite House Shelving, $49-$85, all RH Baby & Child. No doubt about it, your child is going to acquire a lot of stuff while residing under your roof. Some of it will be too pretty to tuck away in a drawer. Think about creative shelving options instead. Wood planks (painted or raw-edged) will do, or something more special, like this. 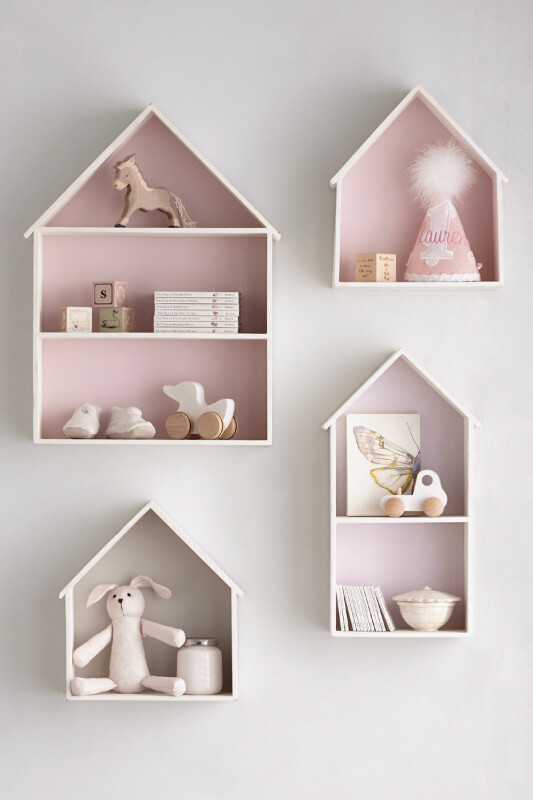 Petite House Shelving, $49-$85, RH Baby & Child. The changing area is an essential part of your nursery...but only for a limited amount of time. 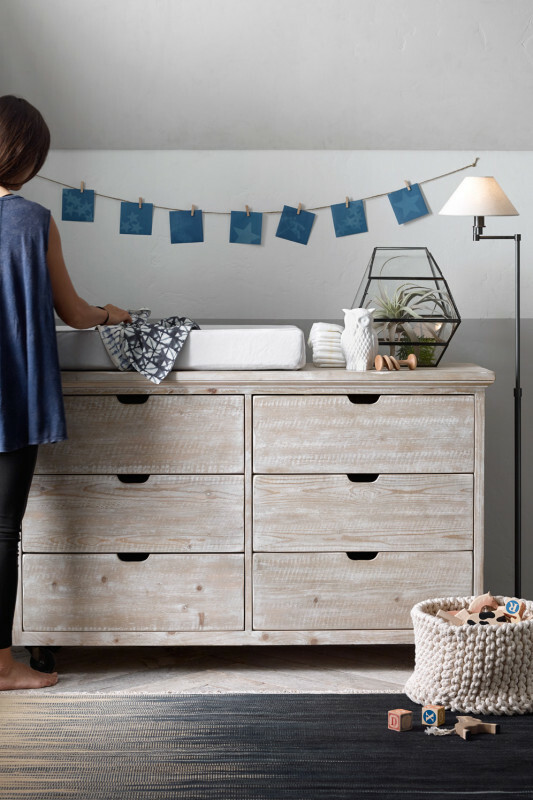 We suggest finding a dresser that you really love (and that's not too back-breakingly low or too dangerously high), and setting up shop on top of it. We also adore the idea of a mirror in this area. It enlarges the space and baby will love to look at himself in it when he's all cleaned up. 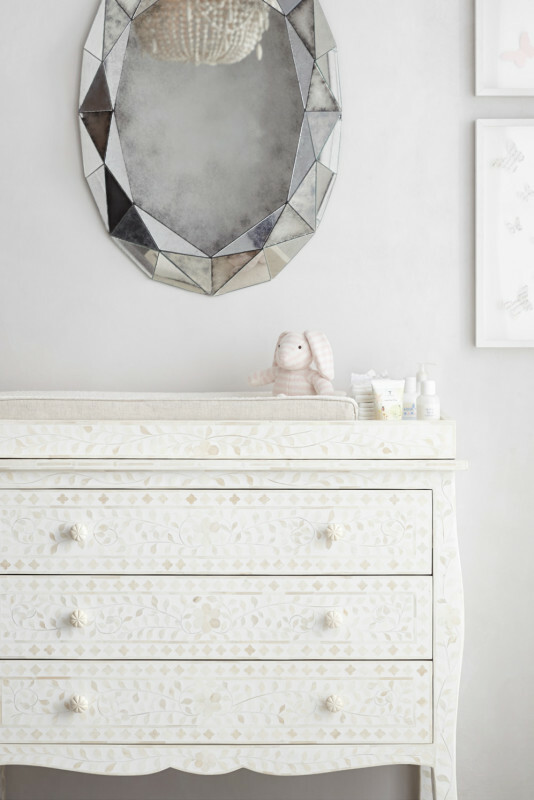 Amira Inlay Dresser, $1449; Amira Inlay Dresser Topper, $279; Washed Organic Linen Changing Pad Cover, $39; Large Jewel Mirror, $699; Luxe Knit Stuffed Bunny, $18, Hand-Folded Paper Butterfly Art, $299, all RH Baby & Child. There's nothing cuter than all things pint-sized, and furniture is no exception. 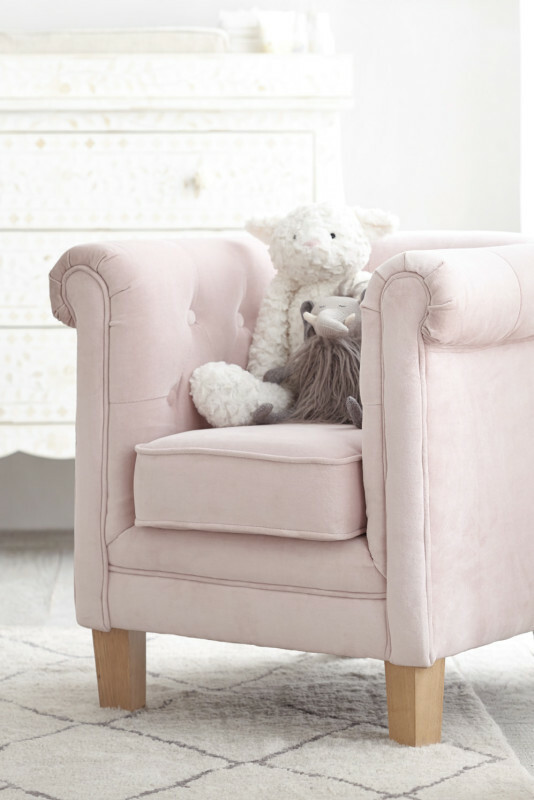 Mini Tufted Tub Chair, $299; Textured Plush Lamb, $49; Wooly Plush Elephant, $18, all RH Baby & Child. Add instant personality to your child's space with a standout mobile (we love these little bunnies), and blankies that add texture and color. Mobiles are great for areas where your baby will be laying on her back, such as a changing table or crib. Hang them low until your infant's vision has developed, and raise them once your child is into standing up, grabbing, and pulling. 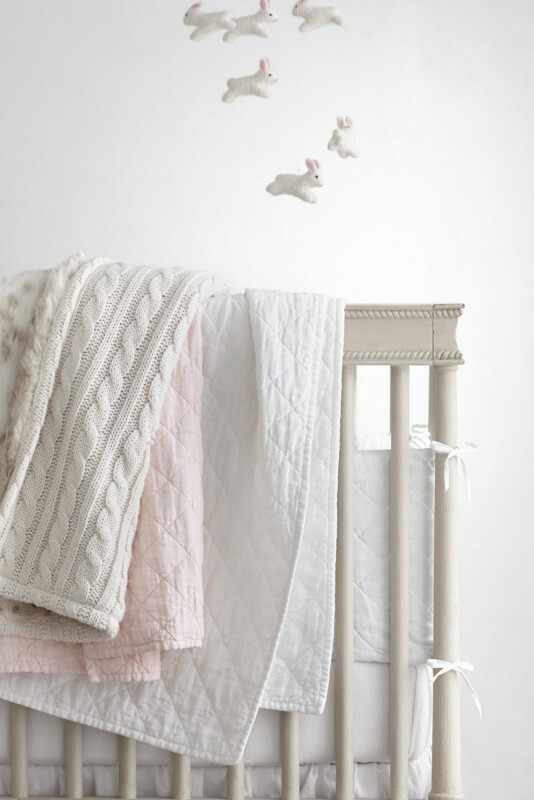 Wool Felt Bunny Mobile, $59; Cable Knit & Luxe Faux Fur Stroller Blanket, $46; Garment-Dyed Diamond Toddler Quilt in Pink, $129; Garment-Dyed Diamond Toddler Quilt in White, $129; Airin Spindle Crib, $849; Garment-Dyed Diamond Quilted Crib Bumper, $219; Garment-Dyed Linen Crib Fitted Sheet, $69; Garment-Dyed Linen Skirt, $219, all RH Baby & Child. 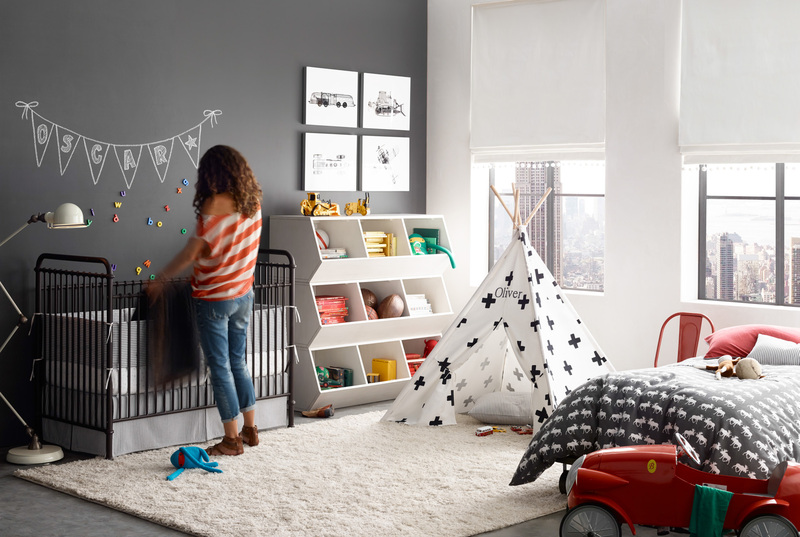 The crib will help set the tone for your entire room. So, it's a good purchase to focus on early. Then, you can build your room around it (especially since it usually takes up a large footprint). Don't rule out untraditional cribs, like a round version, versus a more traditional rectangular option. Ellery Round Crib, $1249; Washed Organic Linen Round Crib Bumper, $189; Washed Organic Linen Round Crib Fitted Sheet, $64; Washed Organic Linen Round Crib Skirt, $129; Garment-Dyed Diamond Toddler Quilt, $129; Shelter Swivel Glider With Slipcover, $1249-$1899; Vintage Spool Side Table, $349; Matra Flatweave Rug, $499-$1349; Portico Lantern Pendant, $129.99; Industrial Era Task Clip Lamp, $79; Knit Cotton Pouf, $89-$149; Garment-Dyed Crochet Linen Drapery, $139-$159, all RH Baby & Child. Another major statement-maker and something that can bring your entire room together is a standout rug. From patterned versions to shaggy solids, it's a great way to add instant texture and personality to a mostly white room. It's also a great way to add style—if you're using modern furniture, think about getting a vintage rug, and vice versa. 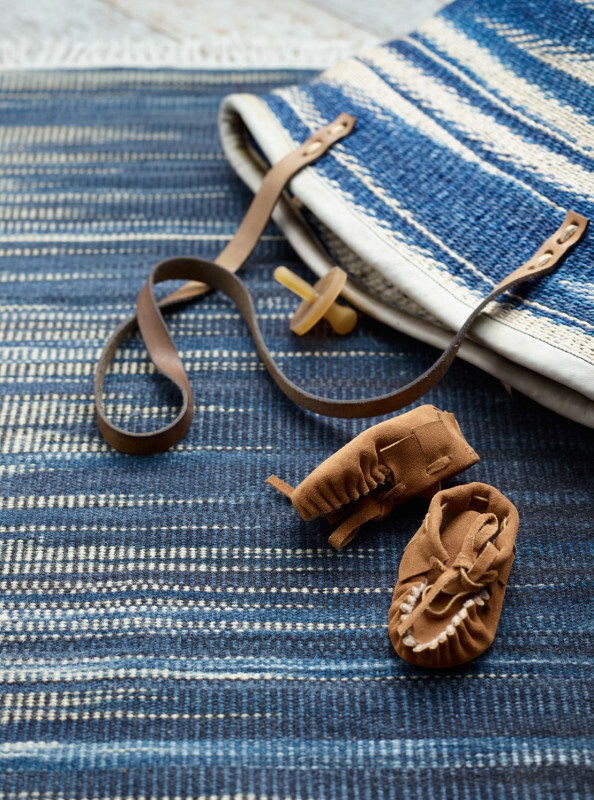 Matra Flatweave Rug, $499-$1349, RH Baby & Child. One easy way to up the intrigue in your nursery is to deck the walls with paint or wallpaper. We especially like the affordable option of a painted wainscot wall—a 1/2-white, 1/2-colored design that looks thoroughly modern. 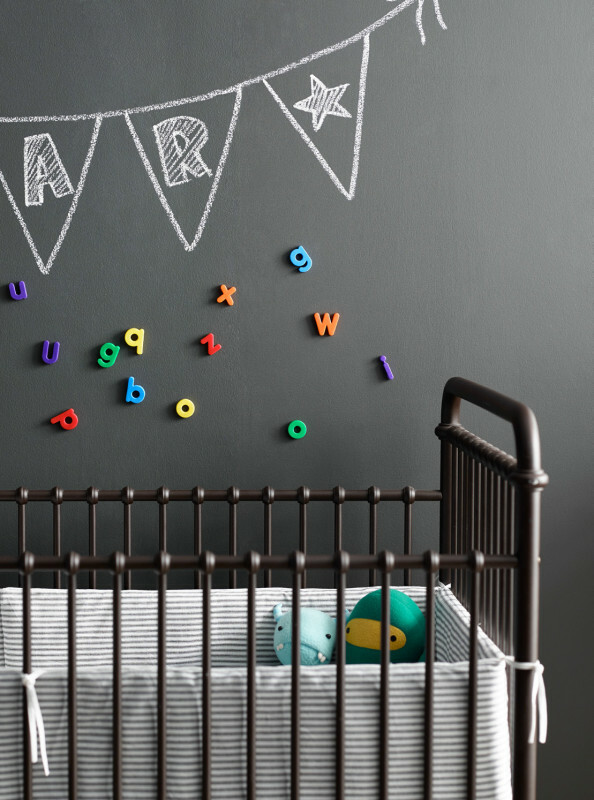 Make sure you use low- or no-VOC paint and allow the room to air out for a few weeks before your baby's arrival. Eco-Friendly Interior Latex Paint, $40; Tribeca Wide Dresser, $1099; Cuddle Plush Changing Pad Cover, $29; Owl Porcelain Nightlight, $32; Faceted Glass Terrarium, $119-$159; Knit Cotton Storage, $45-$65; Ellis Swing-Arm Floor Lamp With Shade, $169; Matra Flatweave Rug, $499-$1349; Sun Art Paper, $10, all RH Baby & Child. You'll be surprised at how much time you spend in this little nook, feeding and reading to your babe. Make sure you invest in a comfy seat, a light that you can easily reach, and a sturdy table that can accommodate a bottle and lots of bedtime stories (we love how this version doubles as a bookshelf). A pouf or ottoman to throw your feet on top of is also a great idea. 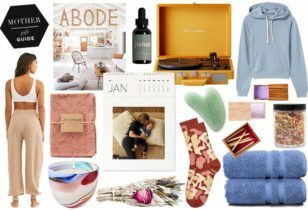 Shelter Swivel Glider With Slipcover, $1249-$1899; Vintage Spool Side Table, $349; Garment-Dyed Diamond Toddler Quilt, $129; Industrial Era Task Clip Lamp, $79; Matra Flatweave Rug, $499-$1349; Garment-Dyed Crochet Linen Drapery, $139-$159, all RH Baby & Child.